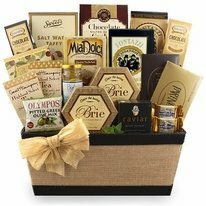 Finding the right corporate gifts for colleagues and supervisors that enjoy the finer things in life can be a challenge. 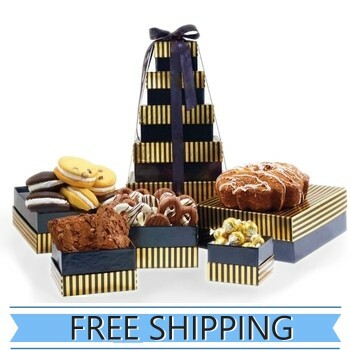 When it comes to unique gift baskets, this Elegant Stripes 5-tier Tower takes the cake� or the cinnamon swirl coffee cake. This beautiful tower is the perfect way to say thank you to a client, corporate tenant, or an entire office. 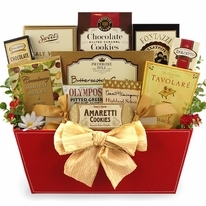 Don�t forget to add a free personalized gift message with your gift tower. 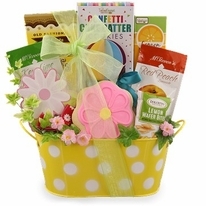 Browse through our many gourmet food gift baskets to find more simple and elegant ways to say thank you.